Meizu, established in 2003, is a Chinese marvel which officially began its smartphone manufacturing in 2007 after realizing the need and appreciation of the mobile phone industry. In the last two years, Meizu grew rapidly resulting in a sales revenue of $3 billion in 2016. After success around the globe, Meizu has expanded its reach further by investing in the Pakistani market, aiming to get bigger with the backing of its energetic and dedicated team. The founder of Meizu, J.Wong, began with MP3 players initially till the product became successful in its own category. This led to the launch of smartphones from their model M8 which served as the first touchscreen phone in China of its time. M9 followed with a retina display, MX with dual-core processors, MX2 & MX3 with thin bezels and MX4 Pro with a front fingerprint sensor. After witnessing the success of Meizu, Alibaba developed a keen interest in the organization and began investing heavily in Meizu’s growth. Alibaba will provide resources and essential support in E-commerce, internet, mobile internet services, data analysis and other aspects while Meizu will extend AliBaba’s mobile internet advantages in the promotion of its smartphones. Meizu’s design philosophy focuses on beautifully engineered body while being compact and elegant. From blasting to polishing techniques, the smartphones deliver an exquisite full metal body. The bespoke innovation stood out when except Apple, the only Android phone with the first front-mounted fingerprint came with Meizu’s MX4 Pro. Meizu invested $2.5 million for the rear screen of its flagship smartphone. This idea came when it was realized that the interior space of mobile phones have become smaller making it difficult to add another. So all that can be seen on the front screen, can be easily viewed on Rear as well, including notifications, selfies, wallpapers, alarm clock and so on. For an unmatchable efficient experience, Meizu developed its own operating system in 2012. Flyme is based on Android for smoother operations and offers greater security. With this, Meizu has become the official certified partner of Google. Every year, Flyme is also progressing with upgraded functionality and interaction. All Meizu phones are powered by the latest Flyme 6.0. With increasing sales of Meizu Smartphones, Flyme users have reached 54 million. Meizu has gained popularity in 30 overseas countries including Russia, Ukraine, Myanmar, Indonesia, Italy, Israel and many more while the venture in Pakistan offers great promise as well. With the organization’s vigorous expansion, the overseas sales of 2016 was 3.5 times that of 2015. With the same notion, Meizu is set onwards with its success in Pakistan providing up-to-date products while already anticipating a great number of users. The latest Flyme 6.0 is based on the three year old Android Marshmallow LMAO. I… think you need to follow your own advice LMAO. 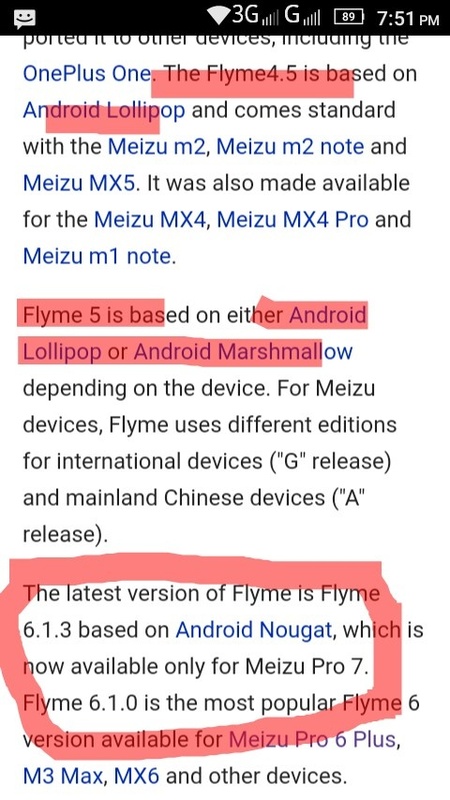 In case it’s too difficult to comprehend, let me spell it out for you: Open the Wikipedia article for Meizu and scroll down to Flyme. Now read it carefully. And be careful not to embarrass yourself next time.